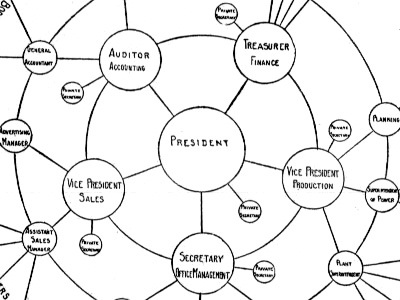 An impressive organization chart from 1924 with a clear emphasis on the central authority, which makes it difficult to ascertain the relations of the subordinate divisions. 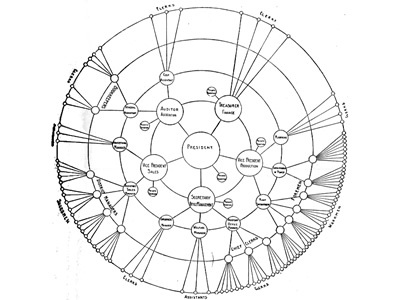 However, its radial structure has some interesting applications in many centralized (not to use the word authoritarian) systems. Good visual representation of the connecting network around the central leadership role. It does bring up some conflicting thoughts on whether the organization therefore revolves around the leader, but one could also presumme the leader is the hub, supporting those around him.